Is Uber a transportation company or a technology company? We know their passengers are customers (with all the manipulation and data mining that goes along with that), but what about their drivers? Are they independent contractors, consumers, or heaven forbid, employees? Uber argues for each alternative, depending on the situation. Technology ethnographer Rosenblat breaks those arguments down, focusing on bait and switch recruiting, misleading fares, skimmed tips, and algorithm-based processes that take the ‘independent’ out of contractor. And when something goes wrong, drivers are left to automated responses and powerless offshore call centers. That means there’s less about the specific toxic culture of Uber (though she hardly ignores them) and more about problems that are more endemic to all sharing platforms. 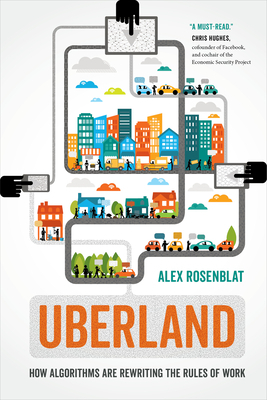 Based on Uber’s previous run ins with journalists, Uberland includes a chapter on methodology, as well as copious notes. It’s what I’d call accessible academic, so expect less storytelling and more thesis support. But if you’re interested, as I am, in what technology is doing to our lives, it’s must reading.